The gameplay of the Pokémon video game series involves the catching and training of a variety of fictional creatures called "Pokémon" and using them to battle other Trainers. Each successive generation of games builds upon this concept by introducing new Pokémon, items, and gameplay concepts. Some of the general concepts were featured elsewhere in the franchise before being introduced to the games; double battles appeared in the anime long before appearing in the games, and Pokémon Abilities are similar to the Pokémon Powers introduced in the Pokémon Trading Card Game, which also introduced Shiny Pokémon, different colors of that type of the original Pokémon. Each of the games in the handheld Pokémon RPG series, from the first games in 1996 to the latest ones in 2017, takes place in a particular fictional region of the Pokémon world, and begins with the player receiving a Starter Pokémon from that region's Pokémon Professor. By traveling around the world, catching and evolving Pokémon, and defeating other Trainers in battle, the player increases the size and strength of his or her Pokémon collection. A major subplot of each game is to defeat a criminal organization trying to take over the world through the misuse of Pokémon. These organizations include Team Rocket, Team Aqua and Team Magma, Team Galactic, Team Plasma, Team Flare, and Team Skull/Aether Foundation. Completing the main storyline opens up other features in the games; this is primarily done by allowing passage into otherwise inaccessible places. Afterward, the game remains virtually open-ended, with the ultimate goal of the player being to obtain at least one member of each of the different species of Pokémon, thus completing the Pokédex. With the exception of the first generation and second generation, once all species of regional Pokémon are caught, the player may then update his Pokédex to the National Pokédex, with the new mission of catching all Pokémon from the previous series (aside from several event-exclusive Pokémon such as Jirachi and Volcanion). The number of Pokémon increases with each game generation, starting from 151 in the first generation to 807 as of Ultra Sun and Ultra Moon. One of the reoccurring aspects of the Pokémon series of role-playing games is the choice of one of three different Pokémon at the start of the player's adventures. These trios are often labeled "starter Pokémon". The starter Pokémon, in chronological order of first appearance, are Bulbasaur, Charmander, Squirtle, Chikorita, Cyndaquil, Totodile, Treecko, Torchic, Mudkip, Turtwig, Chimchar, Piplup, Snivy, Tepig, Oshawott, Chespin, Fennekin, Froakie, Rowlet, Litten and Popplio. Players have the option to choose one of three different types of Pokémon: a Grass type, a Fire type, and a Water type, though many starter Pokémon have an additional type or gain one by evolution. These Pokémon are supposedly indigenous to their regions, yet otherwise unattainable except through trading with another game, leading to their rarity. Many games include a rival character, who receives the Pokémon whose type is advantageous against the player's starter Pokémon. The exception to this concept is Pokémon Yellow, in which players are given a Pikachu, the Electric-type Mouse Pokémon famously serving as the mascot of the Pokémon media franchise, who walks along behind them. The rival Trainer receives an Eevee, a Normal-type Pokémon. The Eevee will evolve into one of its three different evolved states depending on how well the player fares in battles with the rival in the beginning of the game. Pokémon Gyms (ポケモンジム, Pokémon Jimu) are buildings situated throughout the Pokémon world, where Pokémon Trainers can train or compete to qualify for Pokémon League competitions. Although the internal organizations of Pokémon Gyms may vary, all specialize in one certain type of Pokémon, and all are manned by a Gym Leader (ジムリーダー, Jimu Rīdā), a formidable Trainer that acts as a boss. Pokémon Gyms can be found in most towns and cities in the Pokémon world. When an official Gym Leader is defeated, the challenger wins a Badge (バッジ, Bajji), which serves as proof of a Trainer's skill and is a key part of advancing the plot. Victory also earns the challenger a Technical Machine, which allows the player to teach his or her Pokémon a certain move. It also usually enables the player to utilize the overworld effects of one of the various Hidden Machines, such as the ability to cross bodies of water with the move Surf or the ability to remove some trees from paths with the move Cut. As the player collects Gym Badges, the maximum level at which traded Pokémon obey their commands increases. After a player defeats the eight Gym Leaders, he or she can travel through Victory Road, which is often the final route, and then proceed to the Pokémon League and challenge the Elite Four (四天王, Shitennō) and the region's Pokémon League Champion (チャンピオン, Champion). Defeating the Champion is considered to be the goal of the game. In Sun, Moon, Ultra Sun, and Ultra Moon, there are no Gyms or Gym Leaders. The player is instead given various "trials" by characters known as Trial Captains. Though a similar concept, a trial is not necessarily a battle. A trial usually presents the player with a task they must complete to summon a Totem Pokémon, a more powerful version of a certain species of Pokémon. Once the player has summoned and defeated the Totem Pokémon, they receive a Z-Crystal, an item that allows Pokémon to use extremely powerful moves. Completing all of the trials on an island allows the player to challenge that island's "kahuna" in a standard Pokémon battle. The player can challenge the recently built Pokémon League after they have completed all four Grand Trials. After defeating the Elite Four, the player must then defend their title as Alola's First Champion by defeating a challenger. 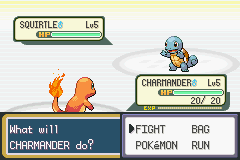 In a battle scene in Pokémon FireRed Version, the Pokémon at the top right of the screen is the opponent's; the bottom left is the player's. The player's options are shown at the bottom right. Battles between Pokémon are the central game mechanic of the Pokémon games. They are used to train Pokémon to become stronger, as competitions, and to reach certain objectives within the game. Battling can also be done between players by connecting two games. Pokémon uses a turn-based system. When the player challenges a Trainer or encounters a wild Pokémon, the screen changes to a battle scene with the player's Pokémon, the opposing Pokémon, their respective HP bars, and an option menu. At any time, the player may carry up to six Pokémon in his or her active party; the first Pokémon in the lineup is automatically sent into battle. At the start of each turn, both sides can choose to attack, use an item, switch the Pokémon for another in their party, or attempt to flee from battle (against a wild Pokémon). If both sides attack, the one who goes first is determined by Speed, although some moves, items, and effects can override this. If either side chooses any other option, that action is performed before the attacks. Each Pokémon uses moves to reduce their opponent's HP to zero, at which point the Pokémon faints (ひんし, hinshi) and is unable to battle. (In the Pokémon world, Pokémon never die as a result of battling.) If the player's Pokémon wins, it receives experience points; when enough have accumulated, the Pokémon's level increases. If the player's Pokémon faints, he/she may use another Pokémon; in battles against wild Pokémon, the player may attempt to flee instead. If all of a player's Pokémon have fainted, the player loses the battle. This causes the player to lose some money and return to the last Pokémon Center he or she visited. Pokémon Ruby and Sapphire introduced Double Battles (ダブルバトル, Daburu Batoru), in which the opposing teams battle with two Pokémon at a time. Though the basic mechanics remain the same, moves may have multiple targets, and some affect the ally as well as the opponents. Additionally, some Abilities work only in Double Battles. Multi Battles (マルチバトル, Maruchi Batoru) were also introduced, with four Trainers in teams of two. The third-generation games only included Double Battles against other Trainers, but Diamond and Pearl introduced Double Battles with wild Pokémon under certain circumstances. Black and White also introduced Triple Battles and Rotation Battles. In Triple Battles (トリプルバトル, Toripuru Batoru), both teams send out three Pokémon at once, with all three battling simultaneously. In Rotation Battles (ローテーションバトル, Rōtēshon Batoru), both sides send out three Pokémon at once, but only use one at a time. The Pokémon which is battling can be switched out with the other two without using up a turn. Pokémon X and Y introduced three new battling mechanics. Sky Battles (スカイバトル, Sukai Batoru) are performed against hard-to-find Sky Trainers and can only be performed with Flying-type Pokémon or those with the Levitate Ability. These are also stated to be particularly difficult. Horde Encounters (群れバトル, Mure Batoru, "Group Battle") are battles where five wild Pokémon attack at once, encouraging the use of moves that hit multiple targets to make things easier. Inverse Battles (さかさバトル, Sakasa Batoru, "Reverse Battle") are like normal battles, but the entire type chart is inverted. This means that an attack which would normally deal double damage instead deals half damage, and vice versa. Pokémon Sun and Moon also introduce a new battle type, the SOS Battle. In these battles, the opposing Pokémon may call for an allies to assist them, making the battle two-on-one against the player. This chart shows the current eighteen Pokémon types (as of Pokémon Sun and Moon) and their strengths, weaknesses, and immunities against one another. A Pokémon's type (タイプ, taipu) is an elemental attribute determining the strengths and weaknesses of each Pokémon and its moves. Pokémon take double damage from attacking moves of types they are weak to and half damage from moves they resist. These type matchups offset one another in rock–paper–scissors-style relationships. The game's primary example of this elemental relationship is that between the Grass, Fire, and Water types: a Grass-type Pokémon is weak to Fire but resists Water, Fire is weak to Water but resists Grass, and Water is weak to Grass but resists Fire. Some Pokémon types grant full immunity to certain attack types; for instance, Ghost types take no damage from Normal- or Fighting-type moves. These weaknesses, resistances, and immunities can be combined if a Pokémon has two types. For example, a Ground/Flying-type Pokémon would be immune to Electric moves, as its weakness as a Flying Type is negated by its Ground Type; however, such a Pokémon takes quadruple damage from Ice moves, as both Ground and Flying are weak to Ice. Some Pokémon Abilities can change these interactions, such as Levitate making Pokémon immune to Ground-type moves. In the original Red, Green, Blue, and Yellow games, there are a total of 15 Pokémon types, including all those listed above as examples, as well as Poison, Psychic, Bug, Rock, and Dragon. The Dark and Steel types were added in Gold and Silver. X and Y introduced the Fairy type, bringing the total to 18. Some types have special properties unrelated to the damage chart; for example, Grass-type Pokémon are unaffected by spore- and powder-based status moves, and Electric types are immune to being paralyzed. The console RPGs Colosseum and XD featured a unique move type known as Shadow, but it does not appear outside these games. Shadow Pokémon can be considered to be of this type, but they still retain their regular typing as well. In Pokémon XD, Shadow moves are super effective against non-Shadow Pokémon and not very effective against Shadow Pokémon. Like the characters in many role-playing video games, Pokémon are able to learn a wide variety of moves (技, waza). These moves may inflict damage, induce status problems, restore health, or perform actions that in some way affect the battle. The general strength of and resistance to these moves are determined by the various statistics a particular Pokémon has. All moves have a type, power (威力, Iryoku), accuracy, and number of Power Points (PP). The moves that one Pokémon may learn are different from another depending on the species of Pokémon; even those that evolve from others do not necessarily learn all the same moves that their predecessors learn. Each Pokémon may only know a total of four moves at any one time. Moves may be learned through leveling up, using TMs and HMs, breeding, and move tutors (NPCs that teach moves). Each move is classified as one of the 18 Pokémon types. The effectiveness of a move is dependent on how susceptible the target Pokémon's type is to the move's type. Phrases associated with this aspect are "It's super effective!" (damage is at least doubled), "It's not very effective…" (damage is at least halved), and "It doesn't affect [defending Pokémon]..." (damage and all effects are negated). A Pokémon with the same type as the move it uses will receive a 50% bonus to its damage, referred to as a "Same-Type Attack Bonus" (STAB) in game jargon. Moves are further defined as "physical" or "special"; physical moves are generally those that would make physical contact, such as punches or bites, while special moves generally involve elemental control, such as breathing fire or manipulating the wind. Prior to the Diamond and Pearl games, moves' status of being either physical or special depended on the type, rather than on the individual move. There are also "status" moves, which deal no direct damage and often inflict status changes on the defending or attacking Pokémon. Damage-inflicting moves remove a certain number of Health Points from the target Pokémon based on the types of the move and its target, and on the statistics of the two Pokémon. The damage can also be affected by items held by either Pokémon or by their Abilities. Each move has a specific accuracy (命中, Meichū), which determines the chance of hitting the target Pokémon assuming no changes to user's accuracy or the target's evasiveness. Very powerful moves often have below-average accuracy. Moves with standard 100% accuracy ratings are susceptible to changes in accuracy and evasiveness, but specific never-miss moves such as Aerial Ace bypass both and always land. The PP (Power Points) of a move indicate how many times a Pokémon may use that move. As with accuracy, a powerful move is often offset by having a low number of PP. Once a Pokémon uses up all the PP for a certain move, it can no longer use that move. If a Pokémon expends all the PP for all of its moves, it then resorts to a move called Struggle, which damages the user as well as the target. Depleted PP can be restored by using certain items or by visiting a Pokémon Center. Many moves have effects beyond inflicting damage. A common secondary effects is a chance to induce a certain status effect (状態異常, jōtai ijō) on the target: paralysis (まひ, Mahi), burn (やけど, Yakedo), freeze (こおり, Kōri), poison (どく, Doku), or sleep (ねむり, Nemuri); each negatively affects how the afflicted Pokémon performs in battle. For example, many Electric-type moves have small chances of Paralyzing the target. Some moves have negative side-effects for the user, such as forcing the player to wait a turn before or after use, or causing recoil damage. A few moves, such as Splash, deal no damage and have no effect whatsoever except when used as a Z-Move. Once per battle, if a Pokémon holds a Z-Crystal, it can use an upgraded version of one of its moves. This upgraded move is called a Z-Move. Z-Moves based on attacking moves tend to have much higher power than normal; those based on status moves usually incur a benefit on the user before executing the move. The player cannot execute more than one Z-Move per battle. Certain moves can also be used in the overworld in order to bypass obstacles (e.g. small trees), quickly travel between previously-visited locations, escape dungeons, or heal Pokémon. Usually, Pokémon will learn these moves with the use of the HM items and will be able to use them in the aforementioned ways after certain Badges are obtained. Pokémon abilities (特性, Tokusei) are special attributes which were introduced in Pokémon Ruby and Sapphire. Specific species of Pokémon have one to three possible Abilities, with individual Pokémon exhibiting one Ability each. Unlike the moves a Pokémon knows, its Ability cannot normally change (except sometimes during evolution, and by using the rare item Ability Capsule, which was introduced in Pokémon X and Y). Most Pokémon use their Abilities in battle. Abilities can strengthen a Pokémon's own statistics or weaken a foe, inflict status effects such as paralysis or poisoning, or perform other effects. For instance, a Bulbasaur uses its Overgrow Ability to power up its Grass-Type attacks when it has low HP, and when Arbok is sent into battle, it will use its Intimidate Ability to lower the opposing Pokémon's Attack statistic. Some Abilities also grant immunities or resistances, such as Lapras's Water Absorb restoring its own HP when hit by Water-type attacks. Not all Abilities are helpful and may be implemented to hinder a Pokémon. For example, Slaking, which would otherwise be extraordinarily powerful, has the Truant Ability, which only allows it to attack every other turn. Some Abilities have effects outside of Pokémon battles. For example, Pokémon with the Pickup Ability, like Meowth, will sometimes retrieve items off the ground. A Pokémon with the Ability Intimidate, mentioned above, will cause the player to encounter lower-level wild Pokémon less often. Pokémon Black and White introduced Hidden Abilities, which initially could only be found on Pokémon primarily acquired from the Internet-based Pokémon Global Link, either through the Pokémon Dream World feature or through promotional releases. There are also rare instances of Pokémon with their Hidden Abilities available in the main game, either as a special encounter or as an in-game Trade with an NPC. Black 2 and White 2 introduced the game mechanic of Hidden Grottoes (隠し穴, Kakushi Ana), areas where the player has a chance to find a Pokémon that has its Hidden Ability. Subsequent games introduced more means of obtaining Pokémon with Hidden Abilities; for instance, Pokémon encountered in Horde Battles have a small chance of having their Hidden Ability. All Pokémon have six statistics (能力, Nōryoku, "Attribute") (colloquially called "stats") which affect their performance in battle. These are HP, Attack, Defense, Special Attack, Special Defense, and Speed. These statistics can be temporarily modified during battle by Abilities, items, and moves. HP (short for Health Points): A Pokémon faints when its HP reaches zero, and it cannot be used in battle again until it is revived at a Pokémon Center, or with a special item. However, they can still use moves in the field. Attack (こうげき, Kōgeki): Determines the strength of a Pokémon's physical attacks. Defense (ぼうぎょ, Bōgyo): Determines the Pokémon's resilience to physical attacks. Special Attack (とくこう, Tokukō): Similar to Attack, determines the power of a Pokémon's special attacks. Commonly abbreviated as Sp. Atk. Special Defense (とくぼう, Tokubō): Similar to Defense, determines the Pokémon's resilience to special attacks. Commonly abbreviated as Sp. Def. Speed (すばやさ, Subayasa): After battle commands are entered, the Speed statistics of the participating Pokémon are compared. With some exceptions, Pokémon with higher Speed make their moves before those with lower Speed. There are also two other statistics, Accuracy (命中率, Meichūritsu) and Evasiveness (回避率, Kaihiritsu), which are not affected when Pokémon level up. No Pokémon has innately higher Accuracy or Evasiveness than any other, but they can be modified during battle like other statistics. Increasing Accuracy makes a move more likely to hit, while increasing Evasiveness makes the opponent's move more likely to miss. A Pokémon's Accuracy, the opponent's Evasiveness, and the accuracy value of a given move affect the probability that the move will hit. Evasiveness was called "Evade" in the first generation and "Evasion" in the second. In Pokémon Red, Blue, and Yellow, the Special Attack and the Special Defense stat were a single stat, named the "Special" stat, which determined both power with and resistance against special attacks. When Pokémon level up, their statistics increase, as determined by the Pokémon's base stat values, effort values, Pokémon Nature, and individual values. These variables working in tandem provide each individual Pokémon with its own unique stats. Base stat values (種族値, shuzokuchi), known officially as species strengths, determine the natural statistical strengths of the various Pokémon species. Every species is assigned a number in each stat; the higher the number, the higher the stat can potentially be. While these values may greatly vary between species, they are the same for each member of that species. It is the difference among species which explains why all Aerodactyl will have a higher Speed than any Snorlax of the same level; however, it is the combination of other factors that causes some Snorlax to be faster than others. Adding up all the base stat values for a certain species generates the base stat total, which players use to determine approximately how strong that species is. Effort values (努力値, doryokuchi, EVs) are hidden values that affect the strengths of a Pokémon in particular statistical areas. Differing effort value levels between two Pokémon can create a significant difference in the two Pokémon's statistical strengths. When a Pokémon battles and defeats an opponent, they gain experience points, also known as EXP, and also receive a number and type of EVs according to the defeated Pokémon's species. Every defeated Pokémon gives at least one EV to each of the Pokémon that fought it. Certain factors, like holding the Macho Brace item, can increase the rate at which EVs are gained in battle. In Pokémon Gold and Silver, a condition known as Pokérus (ポケルス, Pokerusu) was introduced that has a small chance of appearing on a player's Pokémon after a battle with a wild Pokémon. Pokérus doubles the rate at which EVs are obtained permanently, and will be contagious for a certain number of days, allowing it to spread to the player's other Pokémon. In addition, consuming certain items can increase a Pokémon's EVs, and certain Berries decrease EVs while increasing a Pokémon's friendship value. There is a limit on the number of EVs Pokémon can have, both for each individual stats and combined across all stats, which prevents stats from increasing indefinitely. The total limit allows for maximum Effort Values in two stats simultaneously. In the first- and second-generation games, a similar system usually referred to Stat Experience or Stat Exp. was used. As with Effort Values, there is a limit to how much Stat Exp. a Pokémon can have in each stat; however, unlike Effort Values, there is no limit to the total Stat Exp. a Pokémon can have across all stats, meaning that a Pokémon can have maximum Stat Exp. in every stat. Also of note is that, in order for Pokémon from the first generation (where there was only one Special stat) and the second generation (where there are both Special Attack and Special Defense stats) to be forward and backward compatible for trading, Stat Exp. was not tracked separately for Special Attack and Special Defense in the second generation games. Instead, the Special Stat Exp. value was used to calculate both Special Attack and Special Defense. In Pokémon X and Y, a minigame known as Super Training (スパトレ, Supatore) is introduced that allows players to more accurately manage the effort values. The player can do this by playing a soccer-like minigame, which also rewards the player with training bags to continue the training passively. The Pokémon's effort values can also be viewed in the Super Training interface, which includes an "Effort-o-Meter" to allow the player to see the maximum capability of increasing the Pokémon's effort values. In Pokémon Sun and Moon, a graph of a Pokémon's EVs along with its base stats can be seen by pressing the Y button while viewing the summary of a Pokémon. A sparkling stat shows that the Pokémon had obtained the maximum number of EVs for the stat. Pokémon can gain EVs passively through a feature called "Poké Pelago". Pokémon Natures (性格, Seikaku) were first introduced in Pokémon Ruby and Sapphire. Each Pokémon has a Nature, randomly assigned when it is generated, which cannot be changed. A Pokémon's Nature affects the rate at which some of its stats increase: out of the twenty-five possible Natures, twenty will increase one stat's growth rate but decrease another's. The other five modify the same stat in both increases and decreases, and thus the Pokémon's overall growth is unaffected. Natures also determine which flavor of Pokéblocks or Poffins that Pokémon likes and dislikes. Individual values (個体値, kotaichi) or IVs are a hidden value for each statistic which determine a Pokémon's maximum potential. These values are randomly generated along with each Pokémon when it is encountered or bred, and set in stone for the rest of the game. These hidden values are why even Pokémon that seem identical and have been raised the same way may have different stats. IVs range from 0 to 31, and their Generations I and II predecessors, "determinant values", ranged from 0 to 15. Items can be found in the world, given to the player by NPCs, or bought at shops for in-game currency. Many items received in the game are used to heal Pokémon during and outside of battles, much like a Pokémon Center does. Potions and drinks restore HP. A range of items cure various status conditions, such as Antidotes for poisoning and Awakenings for sleep. Revives restore a Pokémon back to health after it has lost all of its HP. Ethers and Elixirs restore the PP of a Pokémon's moves to varying degrees. Technical Machines (わざマシン, Waza Mashin) and Hidden Machines (ひでんマシン, Hiden Mashin), commonly abbreviated as TMs and HMs, can be used to teach moves to Pokémon, including some moves that they would otherwise not learn by increasing in level. TMs are commonly found in the field, in shops, and as rewards for defeating a Gym Leader. Up until the fifth generation, a TM could only be used once. HMs are more rare, but can be used as many times as desired. HMs are often vital to game progression as they have important effects outside of battle, allowing the player to traverse certain obstacles. For example, Pokémon who learn the HM move Surf can transport the protagonist over water, which is necessary to reach island locations. These effects are usually accessible only after defeating a particular Gym Leader. When a Pokémon learns an HM move, the move cannot be deleted or replaced unless the player uses the services of an NPC known as the Move Deleter. Some Pokémon can learn TMs or HMs that their pre-evolutions or evolutions can't. Two prime examples are Kirlia, who can learn Dazzling Gleam and Swords Dance, with both of its evolutions learning one but not the other; and Gyarados, who can learn Surf when its pre-evolution can't. Key items are rarer than regular items and are usually given to the player rather than found. These include fishing rods which are used to find water-dwelling Pokémon, a bicycle which allows the protagonist to move around faster, a dowsing machine, and keys which open locked doors leading to important areas. These items cannot be thrown away, sold, or given to a Pokémon. Starting with Pokémon Gold and Silver, each Pokémon is able to hold a single item. Items carried by Pokémon can have a range of effects. Some, like Berries, are consumed after one use and boost HP or stats. Others persistently boost move power, defense, Speed, and more. Just like moves, some items hinder the user to compensate their power; for instance, the Life Orb boosts the damage of all of the holder's attacks, but hurts it after each successful attack. Others items solely harm the user except in rare situations, such as the Toxic Orb which badly poisons it. Pokémon X and Y introduced Mega Stones used to Mega Evolve members of the stone's species, and Sun and Moon introduced Z-Crystals, which give the holder access to an especially powerful once-per-battle Z-Move depending on the crystal's relevant base move. Items like the Razor Claw and Razor Fang evolve a Pokémon when held while a condition is met. Most items, including Poké Balls and Potions, can be held but have no effect on their own when held. Items can be moved between, removed from, and neutralized on Pokémon through moves like Trick, Knock Off, and Embargo respectively, or consumed to damage the opponent through the attacks Fling and Natural Gift. Some items, such as Hidden Machines and Key Items, cannot be held. The standard Poké Ball is a well-known icon of the Pokémon franchise. Because each player begins the game with only one starter Pokémon, catching is one of the most fundamental aspects of Pokémon, and the primary method of recruiting new Pokémon to the player's party. In a battle against a wild Pokémon, the player may, instead of defeating it, attempt to catch it by using one of many different types of Poké Balls. The odds of success vary, but are increased if the target Pokémon's HP is low, if the target is affected by a status-altering effect like sleep or paralysis, and if a stronger or specially-suited Poké Ball is used. If the catch is successful, the caught Pokémon's data is added to the Pokédex, the player may give the Pokémon a nickname, and the Pokémon is added to the player's party. However, if the player's party is filled to its maximum of six Pokémon, the caught Pokémon is instead sent to a storage box accessible at Pokémon Centers. In the first- and second-generation games, if the current PC box is full, the player will be unable to catch any new Pokémon until he or she accesses a PC and switches to a different box. In more recent games, new Pokémon are automatically transferred to the next available box. The Poké Ball (モンスターボール, Monsutābōru, "Monster Ball") is a spherical device used by Pokémon Trainers to catch wild Pokémon and store them in the player's inventory when not active. Upon contact, the balls draw a Pokémon inside and then close automatically. Wild Pokémon are able to resist and break free; however, weakened Pokémon and those with status conditions are less able to struggle and therefore more easily caught. Legendary Pokémon are much more capable of resisting being caught, and will often require many Poké Balls or more powerful Poké Balls in order to catch them. If the player attempts to catch a non-player character's Pokémon, the opponent will block the Ball to prevent its theft. As depicted in the anime and manga series, the Poké Ball, when not in use, is the size of a golf ball and, with a press of the central button, enlarges to the size of a baseball. The Pokémon is released for battle by throwing the ball; when retrieving a Pokémon, a beam of red light converts the Pokémon into energy to reclaim it. Poké Balls are explained as being incredibly comfortable for Pokémon, so much that they would willingly enter one without any sort of encouragement. The Pokémon Voltorb, Electrode, Foongus, and Amoonguss are often mistaken for Poké Balls, due to their shape and color schemes which highly resemble Poké Balls. Various types of Poké Balls exist. Introduced in Pokémon Red and Blue, are, in order of progressing strength, the Poké Ball, Great Ball (スーパーボール, Sūpā Bōru, "Super Ball"), Ultra Ball (ハイパーボール, Haipā Bōru, "Hyper Ball"), and the Master Ball (マスターボール, Masutā Bōru). The Master Ball always succeeds against any Pokémon that can be caught, and of which typically only one is available in the game. In Pokémon Gold, Silver, Crystal, HeartGold and SoulSilver, there are fruits called Apricorns, which, when given to Kurt in Azalea Town, make one of seven special types of Poké Balls, depending on the Apricorn's color. The seven kinds of Poké Balls Kurt can make (and the seven color Apricorns they are made out of) are Level (Red), Moon (Yellow), Lure (Blue), Friend (Green), Love (Pink), Fast (White), and Heavy (Black). Beginning in Pokémon Ruby, Sapphire, and Emerald, other specialized balls appear, including the Timer Ball, which becomes more effective as the number of turns in the current battle rises, and the Net Ball, which has a better chance of catching Water and Bug-type Pokémon, among others. In addition, in several games there exists an area called the Safari Zone in which only Safari Balls can be used; these cannot be obtained or used elsewhere in the game. Pokémon Sun and Moon introduced the Beast Ball, which is designed for capturing Ultra Beasts and is much more effective at capturing them than standard Poké Balls. There is also a special kind of Poké Ball known as the Cherish Ball; Pokémon in Cherish Balls can only be obtained through special distribution events. In the Nintendo GameCube RPGs, Pokémon Colosseum and Pokémon XD: Gale of Darkness, the player is able to catch non-player characters' Pokémon through the use of the Snag Machine, which turns Poké Balls into Snag Balls. Snag Balls are capable of catching any Pokémon (with the same strength limitations as the standard Poké, Great, Ultra, and Master Balls), and they are developed by the antagonists to steal Pokémon where they are not common in the wild. Snag Balls can also be used by the player to catch the specific Shadow Pokémon who have been tainted by the antagonist group and that the player is required to purify for game completion. Poké Balls have appeared in every installment of the Super Smash Bros. series, releasing a Pokémon to assist the player who grabbed it. Super Smash Bros. for Nintendo 3DS and Wii U also introduces the Master Ball, which almost always releases a legendary Pokémon, with a small chance of releasing Goldeen instead. UGO.com listed the Poké Ball eighteenth on their list of "Our 50 Favorite Video Game Power-ups" citing how everybody runs to get it in the Super Smash Bros. series. The Pokédex (ポケモン図鑑, Pokémon Zukan, lit. "Pokémon Encyclopedia") is an electronic device designed to catalog and provide information regarding the various species of Pokémon. The name Pokédex is a portmanteau of Pokémon and index. In the video games, whenever a Pokémon is first caught, its height, weight, species type, and a short description will be added to a player's Pokédex. Each region has its own Pokédex, which differ in appearance, species of Pokémon catalogued, and functions such as the ability to sort the list of Pokémon based on alphabetical order or display the Pokémon's size compared to the player character. The "National Pokédex" allows Pokémon from all regions to be catalogued. The Nintendo 3DS application Pokédex 3D Pro features all of the Pokémon with all of its forms and each one has its own animation. A series of screenshots depicting an Abra evolving into a Kadabra in Pokémon Emerald. Evolution (進化, shinka) is a sudden change in form of a Pokémon, more akin to a metamorphosis than actual evolution, and is usually accompanied by an increase in stat values. There are several different conditions which can trigger evolution in different species; the most common is gaining enough battle experience. There are many other factors that can determine if, when, and into what, different Pokémon will evolve. The original alternate methods were the use of items called evolutionary stones or by trading the Pokémon to another player. Later additions to the pool of conditions for evolution include dependence on the Pokémon's friendship, the time of day in the game, carrying a unique item while being traded, the gender, the area in the game where the Pokémon levels up, having a separate specific Pokémon in the player's party, trading for a specific Pokémon, knowing a certain move, or holding the game console upside down. The player can choose to halt evolution at any time before the animation is finished by simply by pressing the B button, unless the evolution was intentionally initiated by using an evolutionary stone on the Pokémon. Pokémon whose evolutions are canceled will attempt to evolve again after the condition for evolution is met again. Preventing evolution for a time can be useful, as many Pokémon learn moves sooner in their unevolved form than in their evolved form. The Pokémon Trading Card Game introduced the idea of numerical stages for referring to different points in a Pokémon's evolution. This has translated into colloquial usage among fans of the games. All Pokémon can be placed at one of four evolutionary stages (though no existing Pokémon line includes more than three out of the four stages): Basic Pokémon, Stage 1 Pokémon which evolve from Basic Pokémon, Stage 2 Pokémon which evolve from Stage 1 Pokémon, and Baby Pokémon which are acquired by breeding certain Basic or Stage 1 Pokémon and hatching their Eggs. A Pokémon higher up on this evolutionary scale is sometimes called an evolved form of the previous stages; likewise, a Pokémon lower down on the scale is said to be a pre-evolved form of later Pokémon in the chain. This is the most common method of evolution across all Pokémon generations, and involves Pokémon acquiring experience points through battling other Pokémon. For example, Caterpie evolves into Metapod when it reaches any level at or above 7, and Metapod evolves into Butterfree at or above level 10. Evolutionary stones are items which can be found throughout the games. Some Pokémon can have particular evolutionary stones used on them, and doing so will cause the Pokémon to evolve. Initially five evolutionary stones were introduced into the game, the Water, Thunder, Leaf, Moon and Fire stones. Later generations introduced more kinds, bringing the total to ten in Generation VII. Some Pokémon, like Machoke and Kadabra, evolve when traded between players. Additional evolutionary requirements can also exist; for instance, Seadra evolves into Kingdra only if it holds a Dragon Scale when traded, and Shelmet and Karrablast only evolve when traded for each other. A Pokémon's friendship (なつき度, Natsuki-do, lit. "Degree of Emotional Attachment"; nicknamed "Happiness" by players) is an attribute that can rise or fall based upon several conditions and events. This aspect, introduced in Pokémon Yellow, was what determined Pikachu's stat growth and affected the outcome of certain NPC events (such as receiving Bulbasaur in Cerulean City). In Pokémon Gold and Silver it is a means to evolve several Pokémon. When Pokémon like Chansey or Golbat level up and have very high Friendship, they will evolve. In addition to its use in certain evolutions, there are two moves that base their power on the Pokémon's friendship value—Return and Frustration. In Pokémon X and Y, a feature known as Pokémon-Amie (ポケパルレ, Pokeparure, "PokéParler") was introduced; in Sun, Moon, Ultra Sun, and Ultra Moon, the feature is known as Pokémon Refresh. It allows players to more directly interact with and care for Pokémon in a manner similar to some digital pet games. This minigame utilizes the touchscreen to allow players to pet their Pokémon and feed them sweets to raise their affection value. In battle, Pokémon with high Affection may turn to their Trainer to await orders and express emotions. Additionally, they can receive certain benefits such as an increased chance to land critical hits if their affection has reached a high enough value. Eevee must have high affection and must know a Fairy-type move to evolve into Sylveon. For the concept in biology, see Megaevolution. Mega Evolution (メガシンカ, Mega Shinka) is a mechanic introduced in Pokémon X and Y, which further increases the abilities of specific Pokémon. If the player character possesses an item called the Key Stone (キーストーン, Kī Sutōn), and a Pokémon is holding a Mega Stone (メガストーン, Mega Sutōn) that corresponds to its species with the exception of Rayquaza, which only needs the move Dragon Ascent and must not be holding a Z-Crystal, that Pokémon will be able to Mega Evolve during battle. The player cannot perform more than one Mega Evolution per battle. Only some Pokémon species have corresponding Mega Stones, so only those Pokémon are capable of Mega Evolution. Unlike normal evolution, this transformation is temporary, and the Pokémon will revert to its normal form after the battle. Mega Evolved Pokémon have higher stats than their normal forms, and may also have a different type or Ability. Mewtwo was the first known example of a Pokémon capable of Mega Evolution, with Mega Mewtwo Y appearing in a special episode of the television series and the film Pokémon the Movie: Genesect and the Legend Awakened. Two Pokémon, Charizard and Mewtwo, have multiple Mega Evolved forms, and the one they can Mega Evolve into is dependent on which Mega Stone they hold; for instance, if Mewtwo holds a Mewtwonite Y, it will Mega Evolve into Mega Mewtwo Y.
Primal Reversion (ゲンシカイキ, Genshi Kaiki) is a mechanic introduced in Pokémon Omega Ruby and Alpha Sapphire. Only two Pokémon, Groudon and Kyogre, are capable of Primal Reversion. These Pokémon will undergo Primal Reversion automatically if they hold the Red Orb or Blue Orb (respectively) when sent into battle. Like Mega Evolution, Primal Reversion increases the Pokémon's stats and changes their Abilities; however, Primal Reversion has been called the reverse of Mega Evolution, since the Pokémon reverts to its older, primal form, rather than a more advanced form. Unlike Mega Evolution, Primal Reversion can be performed more than once per battle. Bond Phenomenon (キズナ現象 Bond Phenomenon) is a mechanic that debuted in the anime's XY series and was introduced into the core series games in Pokémon Sun and Moon. The only Pokémon capable of this transformation is Greninja with the Battle Bond Ability. Greninja will undergo a transformation into Ash-Greninja if it knocks out a Pokémon during battle, giving it an appearance similar to Ash Ketchum, increased stats, and a stronger Water Shuriken. Unlike Mega Evolution, Primal Reversion, and Ultra Burst, Bond Phenomenon does not require a corresponding item. Ultra Burst (ウルトラバースト Ultra Burst) is a mechanic introduced in Pokémon Ultra Sun and Ultra Moon. Only Necrozma in either its Dusk Mane or Dawn Wings form is capable of Ultra Burst. Necrozma may undergo Ultra Burst when it is holding the Ultranecrozium Z Z-Crystal, which will allow it to transform into Ultra Necrozma. Then, if it knows Photon Geyser, will be able to use the Z-Move Light that Burns the Sky on the next turn. Like Mega Evolution, Bond Phenomenon, and Primal Reversion, Ultra Burst increases Necrozma's stats and is a temporary transformation. "Legendary Pokémon" (伝説のポケモン, Densetsu no Pokémon) is a term of art. A Legendary Pokémon is not simply an individual Pokémon about which legends are written; rather, a species is considered “Legendary” if and only if it has been designated as such by The Pokémon Company. Since the Gold and Silver versions of the games (with the exception of FireRed and LeafGreen), the main series' game package features one Legendary Pokémon, usually the Pokémon most involved in the main storyline of that game. Legendary Pokémon are often described as being exceptionally rare. In most cases, Legendary Pokémon are exceptionally powerful, difficult to catch, and unable to evolve (with the exception of the Type: Null and Cosmog evolutionary lines), and no known Legendary Pokémon is capable of breeding. Many Legendary Pokémon also lack a gender. Certain Legendary Pokémon colloquially termed "runners" or "roaming Pokémon" randomly move around the world map and flee from battle, making them even harder to obtain. "Mythical Pokémon" (幻のポケモン, Maboroshi no Pokémon) is a separate group of Pokémon. The term is commonly associated with Pokémon that cannot be obtained through standard gameplay, requiring an external mechanic to obtain them; however, some Mythical Pokémon have been made obtainable in later releases, notably Deoxys. These Pokémon are usually placed at the end of their respective games' Pokédex and can only be obtained through distribution events set up by Nintendo. The first of these Mythical Pokémon was Mew, who was programmed into the Red and Green games as a secret character by Shigeki Morimoto without any knowledge of the other members of the development team, and was not announced until several months after the games' release in a special promotion. Since then, the games have continued to feature Pokémon that cannot be obtained through standard gameplay, but the programming that allow the player to catch them within the games can be activated by special items (or other Pokémon) distributed by Nintendo. The first of these such items was the GS Ball in Crystal, which was distributed to players in Japan through the mobile phone connector, allowing them to encounter Celebi. Like Legendary Pokémon, Mythical Pokémon are generally extremely powerful and difficult to catch, are usually not part of an evolutionary line (with the exception of Meltan and Melmetal), and cannot breed (with the exception of Manaphy). The player finds a green Zubat in Pokémon FireRed Version. Shiny Pokémon were first introduced in Gold and Silver as a way to demonstrate the new color-capabilities of the Game Boy Color system. These are Pokémon which have a different coloration than normal; in earlier games, this was done by means of a palette swap. Encountering a Shiny Pokémon is extremely rare; the probability under normal conditions is 1 in 8,192 (1 in 4,096 from the sixth generation onwards). There are some major exceptions to this rule, such as the red Gyarados present in Pokémon Gold, Silver, Crystal, HeartGold, and SoulSilver, and the black Haxorus, the blue/yellow Gible, and the pink Dratini present in Pokémon Black 2 and White 2. There are various ways of increasing the chance of getting a Shiny Pokémon. In second-generation games, breeding a Shiny Pokémon with a regular Pokémon has a higher chance (1 in 64) of producing a Shiny Pokémon. In Diamond, Pearl, Platinum, X, and Y, the Poké Radar can be used to "chain" Pokémon of the same species, improving the odds of a Shiny Pokémon with each link (up to 40 links, when the odds are 1 in 200). Since Generation IV, breeding Pokémon that originated in games of two different languages results in Eggs with a 1 in 1,638 (Generation IV games) or 1 in 1365 (Black and White onwards) chance to contain a Shiny Pokémon; this method of increasing odds has been dubbed the "Masuda method" after developer Junichi Masuda. Additionally, an item introduced in Black 2 and White 2 called the Shiny Charm increases the probability of finding Shiny Pokémon. However, this item is only accessible long after completing the game, as the player must have completed the National Pokédex (excluding Mythical Pokémon). Beginning in Black and White, certain Pokémon in each game are 'Shiny-locked', meaning the player cannot obtain a Shiny variant of these Pokémon in normal gameplay. Pokémon Sun and Moon's SOS Battle mechanic created a new way to "hunt" for Shiny Pokémon. If a wild Pokémon calls allies to help (requiring the Adrenaline Orb in the games' sequels) and the ally is continually of the same species in a "chain", the chance that it calls a Shiny Pokémon rises up to a base of 13 in 4096 after the 30th is called, as do the chances of Hidden Ability and perfect IVs, though they are capped at four perfect IVs maximum. In their sequels' Ultra Warp Ride minigame, by successfully traveling more light-years through the wormhole on Lunala (Ultra Sun) or Solgaleo (Ultra Moon) and entering wormholes with more rings, the player can increase the chance of finding Shiny Pokémon in the Ultra Space Wilds. Generation 7 also introduced an upgrade to the "Masuda method" referred to as "Swap Breeding"; the game is continually saved and soft-reset until a fast-hatching, dummy Pokémon (such as Magikarp) is hatched shiny within the first thirty attempts, and shininess (among other values) is transplanted to the new Pokémon hatched in the same position as the dummy was. In Gold, Silver, and Crystal, they have slightly above-average stats, but this is because Pokémon's Shininess is determined by their determinant values in those games. In the third generation and onward, however, Shininess is determined by another value, and Shiny Pokémon are not stronger than any other Pokémon in battle. Most fans consider Shiny Pokémon to be collectors' items because of their rarity. The term "Shiny" was initially a term invented by the Pokémon fan community due to the flash of stars that appear when such a Pokémon enters a battle, implying a sheen or crystalline property to the colors of the Pokémon. The term "Shiny Pokémon" was later officially acknowledged in Pokémon Black and White, but it has been used in the anime and in a few strategy guides before this. The term hikaru (光る, "shining") was also a widely used slang term in Japan; Ken Sugimori uses hikaru in the title of a piece of artwork featuring a Shiny Charizard. The alternate term "Alt. Color" (色違い, Iro Chigai) appears among the options the player can choose when filling out forms in the third generation of games. Shiny Pokémon have appeared in the anime, including the aforementioned red Gyarados and a Noctowl that protagonist Ash Ketchum catches and is then featured throughout several seasons. A pink Butterfree was also featured in an episode of the first season of the anime, but this alternate coloration is not what appears in the subsequent video games where the Shiny feature has been implemented. The game link port is located above the volume control on the original Game Boy handheld system. Players have the ability to trade their Pokémon with one another by connecting two compatible games. Trading is an important aspect to the Pokémon games, being the crux upon which much of the franchise is based. This is because the slogan, and consequently the goal, "Gotta catch 'em All," is logistically impossible without trading. Each game released in a generation has certain Pokémon that are exclusive to that version. For example, in Pokémon Red players can catch the Pokémon Ekans and its evolved form, Arbok, while both are absent in the wild in both Pokémon Blue and Pokémon Yellow. Other Pokémon are only available when offered up as a choice. The most obvious example is the choice between three starter Pokémon at the beginning of the game; the only way to get the other two is by trading. Some NPCs offer to trade Pokémon with the player, allowing them to acquire Pokémon otherwise unavailable without connecting to another game. For example, the only way to get a Jynx in Pokémon Red and Blue (other than trading with another game cartridge) is through an in-game trade. The other way that trading is made instrumental in gameplay is that some Pokémon, like Haunter and Machoke, only evolve into their final forms when traded. Trading between games on the Game Boy and related systems is accomplished through a Game Link cable that attaches to ports found on all Game Boy incarnations. The size of the ports varies between consoles, so several hybrid cables have been created that allow, for example, linking between the original Game Boy and the Game Boy Color. Pokémon FireRed and LeafGreen include a special wireless dongle which plugs into the game link port for local wireless communication. On the Nintendo DS, DS Wireless Communications is used instead. Diamond and Pearl also introduced the Global Trade Station/System (or GTS), a place where people all around the world may trade Pokémon using the Nintendo Wi-Fi Connection. In the GTS hall, the player can input their own location and pinpoint the locations of other players they have interacted with. The Nintendo WFC records this data when they trade successfully with someone over the GTS or in their Pal Pad. For the Nintendo 3DS line, two successors to the Nintendo Wi-Fi Connection were implemented in each generation. In the Player Search System in Pokémon X & Y and Pokémon Omega Ruby and Alpha Sapphire, the function is simply called Trade, while in Sun, Moon, Ultra Sun, and Ultra Moon in the Festival Plaza, the function is called Link Trade. The second successor is called Wonder Trade; players choose a Pokémon to trade and are randomly paired with another player around the world. Mystery Gift, a means by which players can receive items from other people, was introduced in Pokémon Gold and Silver and has appeared in every handheld Pokémon game since. To use Mystery Gift, the feature must first be activated in a specific way. In Gold, Silver, and Crystal, if two players line up the infrared ports on their Game Boy Color units and activate Mystery Gift from the intro menu, each will receive an item. This process also sends a record of each player's party Pokémon to the other player's game for a daily event in Viridian City in which they can battle the other player's Pokémon (controlled by the computer). Players can use Mystery Gift an unlimited number of times, but only once per day for each person. In addition, a player of Pokémon Stadium 2 with a Gold, Silver, or Crystal cartridge plugged into the Transfer Pak can use Mystery Gift with a girl in White City. A Mystery Gift can also be received by connecting with a Pocket Pikachu 2 GS. In Ruby and Sapphire, Mystery Gift is replaced with Mystery Event. This feature utilizes the now defunct e-Reader accessory. Using special e-cards, the player could obtain special items such as rare Berries or the Eon Ticket. In FireRed, LeafGreen, and Emerald, Mystery Gift is a means to obtain special items at Nintendo's promotional events through the use of the Wireless Adapter, which allow the player to catch otherwise unobtainable Pokémon, such as Mew and Deoxys. Pokémon Diamond and Pearl expanded Mystery Gift to include a variety of transferring options. After enabling Mystery Gift, players may obtain items via wireless or Nintendo Wi-Fi Connection, and may also transfer them to friends. Wireless connection also allows the player to transfer items from Pokémon Battle Revolution. Currently, Mystery Gift via Nintendo WFC has only been implemented in Pokémon Platinum and Pokémon HeartGold and SoulSilver. However, this was changed when the shiny Pichu was distributed to all version games via WFC. Also, with the creation of the Pokéwalker, in Pokémon HeartGold and SoulSilver, came another way to Mystery Gift. By pressing the connect button on two Pokéwalkers and pointing them at each other, both Pokéwalkers will receive an item, which the player will receive upon connecting with his or her game. Beginning with Pokémon X and Y, an option to receive Mystery Gifts by single-use serial code or password over Nintendo Network was added. Single-use codes are given out in participating retailers and via the Pokémon Global Link and are usually region locked. Wireless and infrared events are no longer region locked, allowing any region console to receive events distributed by those methods. Pokémon Bank (ポケモンバンク, Pokémon Banku) is an application which allows players to store up to 3,000 Pokémon in an online cloud storage service. Players can deposit and withdraw Pokémon from both physical and downloaded versions of compatible games, allowing players to exchange Pokémon between the two versions without the need for a second system. Additionally, an application called Poké Transporter (ポケムーバー, Poke Mūbā, "Poké Mover") allows players to upload Pokémon from Pokémon Black, White, Black 2, and White 2 to the Pokémon Bank, after which they can be imported into newer games. The service requires an annual fee, and there are plans to continue to utilize it for future Pokémon titles. Intended for release on December 27, 2013, Pokémon Bank was postponed due to unforeseen traffic levels on the Nintendo Network service. Pokémon Bank was fully released on the Nintendo eShop on January 22, 2014 in Japan, February 4, 2014 in Europe, and February 5, 2014 in North America. As of an update released on January 24, 2017, Pokémon Sun and Moon have also gained compatibility with Pokémon Bank. The update allows players to send their Pokémon from their core sixth generation games to Sun and Moon, though when transferred, they cannot return to the older games. Additionally, the Poké Transporter was also updated to allow players to transfer Pokémon caught in the Virtual Console editions of Pokémon Red, Blue, and Yellow to Pokémon Sun and Moon. The update also added a new in-app National Pokédex, presumably to make up for the lack of one in Sun and Moon. On November 17, 2017, coinciding with the release of Ultra Sun and Ultra Moon, it was announced that the games would support Pokémon Bank later the same month. The update, which came three days later, also added compatibility with the Virtual Console versions of Pokémon Gold and Silver as well as Crystal (which was not re-released until January 26, 2018) to the Poké Transporter. Pokémon breeding was introduced in Pokémon Gold and Silver. Pokémon can be bred in-game at a Pokémon Day Care (育て屋, Sodateya). These are businesses generally run by an elderly person or couple, which raise Trainers' Pokémon for a fee. If two compatible Pokémon are left there, they will eventually produce a Pokémon Egg (タマゴ, tamago), which the Trainer can pick up for free. After being carried by the Trainer for some distance, the Egg will hatch into a young Pokémon, usually of the lowest stage in its mother's evolutionary line. Some Pokémon have pre-evolutions that are usually only obtainable by hatching them from Eggs. Known as "baby Pokémon", these Pokémon are unable to breed but have evolutions that can breed baby Pokémon. For most baby Pokémon introduced after Gold and Silver, the parent can only produce these Pokémon when holding a certain item. Compatibility is usually restricted to one male and one female. In addition, Pokémon species are assigned to Egg Groups (タマゴグループ, Tamago Gurūpu), which determines their breeding compatibility with other species. Pokémon may belong to up to two Egg Groups; in order to breed, they must share at least one Egg Group. Nearly all Pokémon species, even those that are all-male or genderless, are able to breed with the shape-shifting Pokémon Ditto. The Egg produced will yield a hatchling from the non-Ditto Pokémon's evolutionary line. Two Ditto cannot breed to produce another Ditto. A select group of species cannot breed at all, which includes all Legendary Pokémon, all Ultra Beasts, most Mythical Pokémon, Nidorina and Nidoqueen (but not Nidoran♀), Unown, and all "baby" Pokémon. This is called the "Undiscovered" Egg Group. Although some Legendary Pokémon (such as Heatran and Cresselia) have genders, they still cannot breed. An unusual circumstance involves the relation of the Mythical Pokémon Manaphy and Phione; both can breed with Ditto to create an Egg which hatches into Phione, yet Phione does not evolve into Manaphy. Manaphy itself is obtained from an Egg from Pokémon Ranger games, but it will never breed to produce another Manaphy Egg. Pokémon hatched from Eggs can inherit (遺伝, iden) stats from their parents. Three of the Pokémon's individual values are inherited from one or the other of its parents, and the other three IVs are generated randomly. Moves can also be inherited through breeding. Moves that a newly hatched Pokémon begins with are divided into three categories: learned moves, inherited moves, and hereditary moves or "Egg Moves". Learned moves are moves that the Pokémon would have naturally at its starting level; inherited moves are those that the Pokémon would be able to learn at later levels or through TMs; and Egg Moves (タマゴわざ, Tamago Waza), inherited from the father (or either parent beginning in Pokémon X and Y), are those that the Pokémon would not be able to learn normally. The Pokémon can learn the move on this occasion as it receives the move from a parent of a different species. Upon birth, the young Pokémon's move slots are filled with learned moves. However, if there are any inherited moves or Egg Moves available for the Pokémon to learn, they replace the learned moves. "Battle Frontier" redirects here. For the season of the Pokémon anime, see List of Pokémon: Battle Frontier episodes. In addition to the Pokémon Gyms and other battles to advance the plot, side games and post-game areas have been introduced in subsequent editions of the Pokémon games that extend the gameplay. First introduced in Pokémon Crystal, the Battle Tower (バトルタワー, Batoru Tawā) is a game feature accessible outside of the main storyline where the player faces several Trainers in succession with a limited set of their Pokémon and receive prizes in the form of otherwise rare items. The Japanese version of Crystal which had a mobile phone adapter allowed for players to challenge other players to Battle Tower fights. The next Battle Towers appear in Ruby and Sapphire, which is similar to the Crystal Battle Tower, and in Diamond and Pearl, which has a boss character and a point system similar to the Battle Frontiers. The Battle Frontier (バトルフロンティア, Batoru Furontia) was introduced in Pokémon Emerald, replacing the Battle Tower as found in the Ruby and Sapphire games. In addition to having its own Battle Tower with the same rules as the previous ones, the Battle Frontier adds several other game mechanics that make battles unique in the end game. Examples include the Battle Palace's prohibition on choosing what moves the Pokémon uses and the Battle Factory's random rental Pokémon. Instead of prizes, the player is awarded Battle Points (BP) which can be traded for rare items or TMs. The Diamond and Pearl Battle Tower uses this same system, and it is replaced by a Battle Frontier in Pokémon Platinum. The HeartGold and SoulSilver games also have a Battle Frontier, identical to that of the Platinum version, where the Battle Tower was found in Crystal. After a series of battles in each venue, players encounter Frontier Brains (フロンティアブレーン, Furontia Burēn) who are challenged in the same fashion as all other battles, and the player will either earn a Symbol (シンボル, Shinboru, Emerald) or a Commemorative Print (きねんプリント, Kinen Purinto, Platinum, HeartGold, SoulSilver) for winning. The Frontier Brains can be challenged a second time to more advanced versions of the Symbols or Prints (advancing from Silver to Gold). The Frontier Brains have very powerful Pokémon, often including Legendary Pokémon, making a victory even more difficult than in the main storyline. Emerald also features Battle Tents (バトルテント, Batoru Tento), which allow the player to encounter some of the unique battle mechanics of three of the Battle Frontier venues. Rather than Battle Points, the player is awarded with an item that is rare or expensive. The Battle Subway (バトルサブウェイ, Batoru Sabuwei) is unique to the Black and White games and serves as the games' Battle Tower, taking on the form of a subway to match the games' New York City-styled setting. In the same vein as the Battle Tower in Diamond and Pearl and the various Battle Frontiers, players earn BP and after a certain number of battles they challenge one or both of the two Subway Bosses (Subway Masters (サブウェイマスター, Sabuwei Masutā) in Japan), depending on what type of battles (Single, Double, or Multi) the player was competing in. The Battle Subway returns in Black 2 and White 2, but it is joined by two new sets of areas. The first one introduced in the games is the Pokémon World Tournament (ポケモンワールドトーナメント, Pokémon Wārudo Tōnamento), wherein the player participates in a tournament-style setting with various NPC Trainers, set to a particular theme of a level limit, using randomly assigned teams, or using teams downloaded from the Nintendo Wi-Fi Connection, to earn BP. The more advanced side of the Pokémon World Tournament is a tournament-style setting in battling the Gym Leaders and Pokémon League Champions from all over the Pokémon World, enabling players to challenge characters such as Brock and Misty from Red and Blue, Volkner from Diamond and Pearl, Lance from Gold and Silver, or Steven from Ruby and Sapphire. Also introduced in the games are the Black Tower (黒の摩天楼, Kuro no Matenrō) in Black 2's Black City and the White Treehollow (白の樹洞, Shiro no Judō) in White 2's White Forest. In these facilities, the player must battle a series of Trainers without using items, and only relying on Doctor or Nurse Trainers to restore their team's health. At the end, the player challenges the leader and later is awarded a rare Pokémon for succeeding. The Battle Maison (バトルハウス, Batoru Hausu, "Battle House") is introduced in X and Y, and can only be accessed after the player completes the main story. Similar to the Battle Frontier and the Battle Subway, there are different types of battling methods to choose from: single, double, triple, rotation, and multi battles. Then the player is drawn to a tournament where he/she is challenged to numerous battles with random Trainers. After winning a battle the player receives one BP (battle point) which can later be used to by items, vitamins, and TMs. After winning 21 battles the player must battle the strongest Trainer or referred to as the Battle Chatelaine. It depends on what battle style you choose. If the player beats 50 Trainers, they have the chance to battle one of the Battle Chatelaines again. Only this time do they use legendary Pokémon (e.g. Zapdos, Moltres, Articuno). Another similar feature is the Battle Chateau (バトルシャトー, Batoru Shatō), where the player advances through a ranking system based on the French nobility system after battling increasingly difficult Trainers, including being able to battle the Gym Leaders, Elite Four members, and Champion in the same system. In Pokémon Omega Ruby and Alpha Sapphire, the Battle Maison returns, but the Battle Frontier, which was featured in the original Pokémon Ruby and Sapphire games, is hinted to be in production. The Battle Maison is very similar to the one in Pokémon X and Y, but TMs (Technical Machines) cannot be bought; they are replaced by other items. The Battle Royal (バトルロイヤル, Battle Royal) is introduced in Pokémon Sun and Moon, which involves four Trainers all battling each other at the same time. After becoming Champion, the player is given access to the Battle Tree (バトルツリー, Battle Tree) on Poni Island. The Battle Tree is similar to the Battle Maison, Battle Subway, and Battle Towers from the previous generations. On the 20th battle of normal challenges and 50th battle of Super challenges, a powerful Trainer known as a Battle Legend will be challenged. In addition to battling, several Pokémon competitions have been introduced throughout the series to provide an alternate set of mini-games. Pokémon Contests (ポケモンコンテスト, Pokémon Kontesuto) are competitions of skill among Pokémon Trainers and their Pokémon partners. Pokémon Contests are different from Pokémon battles, testing talent rather than power. They were introduced in Pokémon Ruby and Sapphire and later appeared in Emerald, Diamond, Pearl, Platinum, Omega Ruby, and Alpha Sapphire. There are five categories that a Pokémon can be entered into: Beauty, Cute, Cool, Tough, and Smart. In addition, there are four ranks of contests: Normal, Super, Hyper, and Master Rank. To enter, a Trainer must go to the contest hall that holds contests of the appropriate rank, and in ranks higher than Normal, the participating Pokémon must have won the contest of the selected category in the previous rank. In Diamond and Pearl, Contests are renamed Super Contests, and the four ranks are named Normal, Great, Ultra, and Master. In the first round (called "Visual Competition" in Diamond and Pearl) the Pokémon is shown to the audience, who then vote on their favorite. Pokémon will gain more points here if they have good condition in the selected category, which can be increased by using Pokéblocks. In Diamond and Pearl, Pokéblocks are replaced by Poffins, and the player can also use the stylus to dress up their Pokémon in certain Accessories (アクセサリー, Akusesarī) to fit the theme of the contest. The second round, called "Dance Competition", was introduced in Diamond and Pearl. The participating Pokémon join in a dance routine. The leading Pokémon gets rated based on following the rhythm, and the rest of the Pokémon have to mimic the leader's steps. All four participants take turns to be the leader. The final round ("Acting Competition") comprises a few rounds, and the Pokémon are ordered in sequence based on their performance in the previous round. Each round, the player chooses one Pokémon move to perform before the judge, and in Diamond and Pearl players also choose which of three judges to appeal to. Each move has a category, appeal value, and effect. Using a good combination will gain the Pokémon more appeal points, but using the same move twice consecutively will be less effective. Moves can have many effects, such as "jamming" previous Pokémon to reduce their appeal, or randomizing the order of appeals in the next round. After appeals are concluded, the results are shown, and the Pokémon with the most total points wins a ribbon. Pokéblocks (Polock (ポロック, Porokku)), introduced in Ruby and Sapphire, are candy-like treats used to increase the contest condition and Loyalty of Pokémon. Pokéblocks are created from Berries in the "Berry Blender" minigame, which can be played by two to four human or computer-controlled players. The types of berries blended by all participants affect the category and effectiveness of the resulting Pokéblock. Pokéblocks are also used in the games' Safari Zone to attract wild Pokémon. Poffins (ポフィン, Pofin), a type of baked goods, were introduced in Pokémon Diamond and Pearl as replacements for Pokéblocks. Poffins are made by adding a Berry to some batter in a pot, and stirring it with a stylus using the Nintendo DS's touch screen. Poffins can be mixed only with human partners and can be done solo or with two to four players wirelessly. In Pokémon HeartGold and SoulSilver, the contest minigame is replaced with an athletic competition called the Pokéathlon (ポケスロン, Pokesuron). The competitions range from track and field events such as hurdling or a relay race to a snowball fight and a game resembling pachinko. A Pokémon's stats may be increased by consuming "Aprijuice" (ボンドリンク, Bon Dorinku, "Bon Drink") made from fruits known as Apricorns that the player can find throughout the world. By putting a number of Apricorns in a blender and making the player character run a certain number of steps, the Apricorns are mixed into a milkshake-like blend. The process can be repeated multiple times, each time adding more Apricorns to the mixture and running to blend them. The number of times this is done, along with the variety of Apricorns used, affects the type and effectiveness of the resulting Aprijuice. Aprijuice will increase one of five additional statistics that only exist for the Pokéathlon which consist of Speed (unique from the standard Speed statistic), Power, Skill, Jump, and Stamina. In Pokémon Black and White, the contest minigame is replaced by the Pokémon Musicals (ポケモンミュージカル, Pokémon Myūjikaru). Rather than grooming Pokémon with Pokéblocks, Poffins, or Aprijuice, the player's Pokémon is only dressed in Accessories which can be waved around on stage when the Pokémon dances to various pieces of music; the player does not control the Pokémon during this time, other than Appealing with special props. If the audience likes the performance, they give more props to the player in person post-performance. The player can, in fact, control the camera angle during the performance. Another minigame is added in Black 2 and White 2 called Pokéstar Studios (ポケウッド, Pokeuddo, "Pokéwood"). The player joins the cast of a movie and participates in a mock battle with a chroma key opponent, all while picking line options that match the script of the film and completing an objective within a particular set of turns. Depending on how well the player performs according to the script (or if the player introduced a twist to the intended ending), he or she receives items from the film premiere's audience and unlocks more movies to participate in. ^ Padilla, Raymond. "Pokémon Ruby/Sapphire". GameSpy. Archived from the original on 2013-10-02. Retrieved 2006-05-30. ^ Harris, Craig. Pokémon Yellow: Special Pikachu Edition. IGN. Retrieved 2006-03-27. ^ Pokémon Diamond Version instruction booklet. p. 15. ^ "バトル | 『ポケットモンスターブラック・ホワイト』公式サイト". Retrieved 2010-10-16. ^ "ローテーションバトル | 『ポケットモンスターブラック・ホワイト』公式サイト". Retrieved 2010-10-16. ^ "New Ways to Battle!". Pokemonxy.com. Retrieved 2013-06-12. ^ "「スカイバトル」と「群れバトル」｜『ポケットモンスター Ｘ』『ポケットモンスター Ｙ』公式サイト". Pokemon.co.jp. Retrieved 2013-06-12. ^ "Pokemon X and Y's Horde Battles and Sky Battles revealed". Polygon. 2013-06-11. Retrieved 2013-09-04. ^ "Type Matchup Chart" (PDF). ^ Hernandez, Patricia. "Why Game Freak Introduced The Fairy Type In Pokemon". Retrieved 15 December 2017. ^ "Pokémon Natures: How Personality Changes Stats And Abilities". TheGamer. 12 April 2019. Retrieved 23 April 2019. ^ "25 Things Wrong With Pokémon Red And Blue Everyone Chooses To Ignore". ScreenRant. 29 March 2019. Retrieved 23 April 2019. ^ "Base Stat Ratings - Smogon University". www.smogon.com. Retrieved 23 April 2019. ^ "Super Training". Pokemonxy.com. Retrieved 2013-08-09. ^ "ポケモンを特訓だ！ 新たなポケモンの育て方、「スパトレ」！｜『ポケットモンスター Ｘ』『ポケットモンスター Ｙ』公式サイト". Pokemon.co.jp. Retrieved 2013-08-09. ^ a b "The Breeding Guide Part I - Smogon University". www.smogon.com. Retrieved 23 April 2019. ^ Hilliard, Kyle; Masuda, Junichi (December 2012). "Pokémon's Burning Questions". Game Informer (236): 112. ^ Chris Littler (October 14, 2010). "Our 50 Favorite Video Game Power-ups - UGO.com". UGO.com. Archived from the original on 2010-10-19. Retrieved 2011-03-22. ^ "At Play with Pokémon-Amie!". pokemonxy.com. Retrieved 2013-06-11. ^ かわいがって絆を深める、「ポケパルレ」!｜『ポケットモンスター Ｘ』『ポケットモンスター Ｙ』公式サイト (in Japanese). pokemon.co.jp. Retrieved 2013-09-05. ^ "Pokémon Direct 9.04.2013". Nintendo.com. 2013-04-09. Retrieved 2013-09-04. ^ "Pokémon: 15 Mega Evolutions That Are Completely OP (And 10 That Are Too Weak)". TheGamer. 8 January 2019. Retrieved 23 April 2019. ^ Hernandez, Patricia. "'Primal Reversion' Is Pokémon's New Type of Evolution". Kotaku. Retrieved 23 April 2019. ^ Hernandez, Patricia. "One Man's Five-Year Quest To Find A Shiny Pokémon". Retrieved 15 December 2017. ^ Khaw, Cassandra. "How to Get a Shiny Pokemon In Pokemon X and Y". USgamer. Retrieved 2016-06-17. ^ "How to build an army of competitive shiny Pokémon". Polygon. Retrieved 2018-09-18. ^ "Banco Pokémon y Poké Trasladador". Nintendo of Europe GmbH. ^ Macy, Seth. "Pokémon Sun and Moon Officially Announced". IGN. IGN. Retrieved 27 February 2016. ^ "Pokemon Bank getting National Poked feature with Sun and Moon support - SlashGear". www.slashgear.com. Retrieved 2016-09-21. ^ Macy, Seth (January 24, 2017). "Pokemon Bank Now Compatible With Sun and Moon". IGN. Retrieved January 25, 2017. ^ "Pokémon Ultra Sun & Ultra Moon Will Get Pokémon Bank Compatibility Update In Late November". Siliconera. Retrieved November 18, 2017. ^ a b Hollinger, Crystal, p. 18. ^ Hollinger, Crystal, p. 19. ^ "ポケモンミュージカル | 『ポケットモンスターブラック・ホワイト』公式サイト". Retrieved 2010-10-16. Nintendo Power (2006-08-24). Pokémon Emerald Version: the official strategy guide from Nintendo Power. Nintendo Power. Buchanan, B (2006-08-24). Pokémon Emerald: Official Strategy Guide. Prima Games. Hollinger, Elizabeth M. (2003). Pokémon Sapphire Version [and] Pokémon Ruby Version. Prima Games. ISBN 0-7615-4256-6. Hollinger, Elizabeth M. (2001). Pokémon Crystal Version. Prima Games. ISBN 0-7615-3666-3. The instruction booklet of Pokémon Diamond Version. Nintendo (2007). The instruction booklet of Pokémon Sapphire Version. Nintendo (2003). AGB-AXPE-USA. Marcus, Phillip (2001). Pokémon Gold Version and Silver Version: Official Trainer's Guide. Brady Games. ISBN 0-7440-0005-X. The following games: Pokémon Stadium and Pokémon Stadium 2; Pokémon Ruby, Sapphire, and Emerald; Pokémon FireRed and LeafGreen; Pokémon Pinball; Pokémon Colosseum and Pokémon XD: Gale of Darkness; Pokémon Diamond and Pearl. This page was last edited on 23 April 2019, at 12:52 (UTC).